Excavations of architecture and associated deposits left by hunter-gatherers in the Black Desert in eastern Jordan have revealed bones from wild sheep – a species previously not identified in this area in the Late Pleistocene. According to the team of University of Copenhagen archaeologists, who led the excavations, the discovery is further evidence that the region often seen as a ‘marginal zone’ was capable of supporting a variety of resources, including a population of wild sheep, 14,500 years ago. A study by a team of archaeologists based at the University of Copenhagen published today in the Royal Society journal Open Science documents that the region now known as the Black Desert in eastern Jordan could sustain a population of wild sheep. 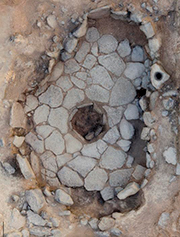 Semi-subterranean basalt paved structure in the BLack Desert, dated to nearly 14,500 years ago. “On the basis of morphological and metrical analysis of the faunal remains from Natufian and Pre-Pottery Neolithic A hunter-gatherer deposits, we can document that wild sheep would have inhabited the local environment year-round and formed an important resource for the human population to target for food. Most significantly, however, the presence of the substantial number of bones identified as mouflon extends the known range of wild sheep. This means that we cannot rely on broad scale maps showing ancient wild animal distributions as neat lines,” said zooarchaeologist and first-author of the study Lisa Yeomans of the University of Copenhagen. The team have been investigating human occupation in the Late Pleistocene of eastern Jordan. The Levant (i.e. modern-day Jordan, Israel, Palestine, Lebanon and Syria) has long been recognised as an important region associated with changes in social complexity and shifts in subsistence economy that pre-empted the shift to agriculture and farming. Hitherto investigations have generally focused on the Natufian occupation in the Levantine corridor while eastern Jordan was considered a more marginal environment. Recent investigations, however, have shown this ‘marginal environment’ of eastern Jordan to be a resource rich environment which offered people the opportunity to hunt a range of species. Read the research paper ‘Expansion of the known distribution of Asiatic mouflon (Ovis orientalis) in the Late Pleistocene of the Southern Levant’ in Royal Society’s journal Open Science. Read more about the Late Epipalaeolithic and Early Neolithic Occupation of the Black Desert project.